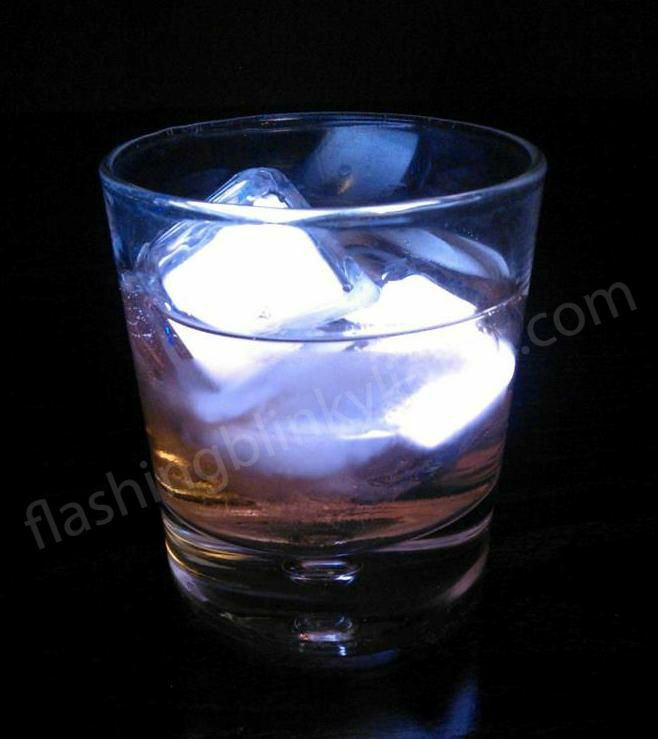 LED Ice Cubes: Know Your Options! 1.) The price tag. 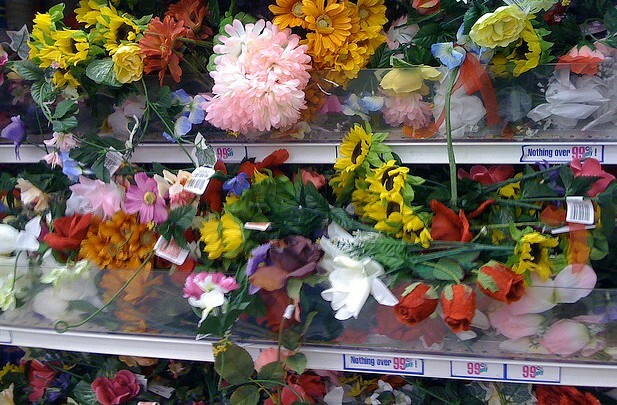 “Price breaks” for our wholesale customers, that’s how we roll. 2.) The realistic rectangular frosty shell. They just don’t make ’em like this, you guys! They being our competitors. 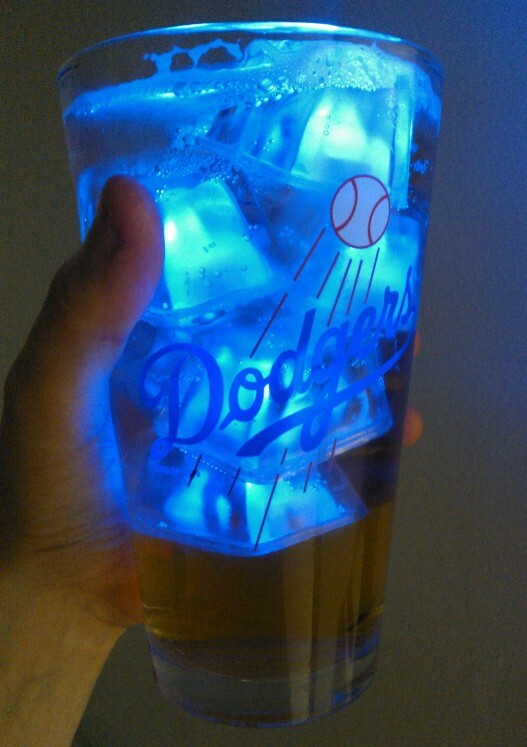 FBL makes thee only realistic looking shell on the LED ice cube market. So special, we had to patent it. 3.) 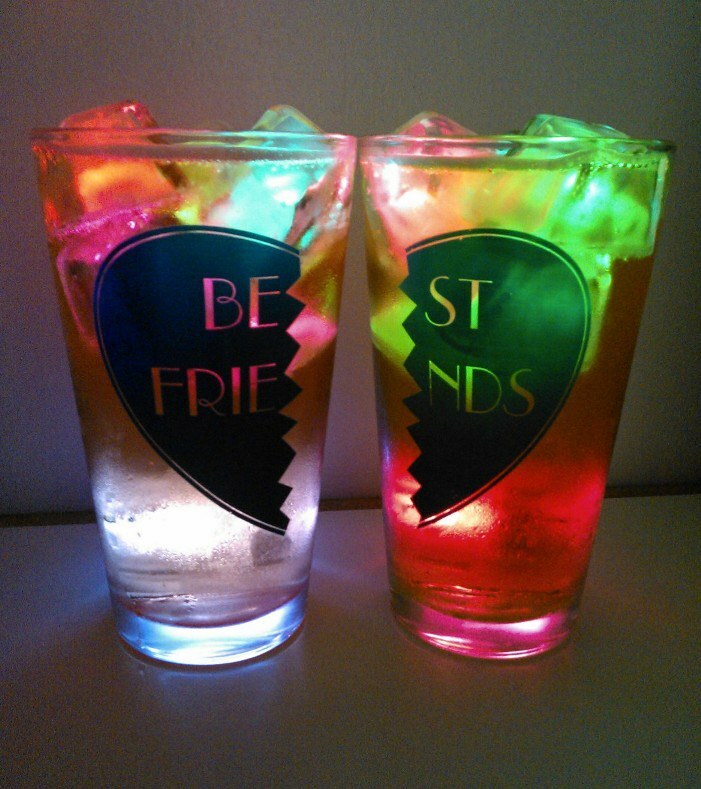 Light drinks on the GO. Small & discreet, I can put a 12-piece box of Inspiration Ice in my bag before a night out and surprise my pals as the sun goes down. Always exciting! Pretty perty in our cups even when there’s still a bit of sunlight. 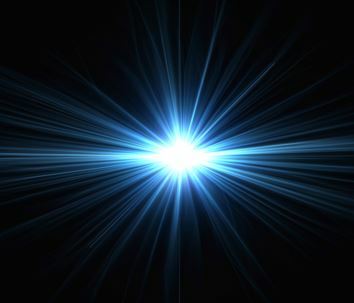 In total darkness, they are extra magical. 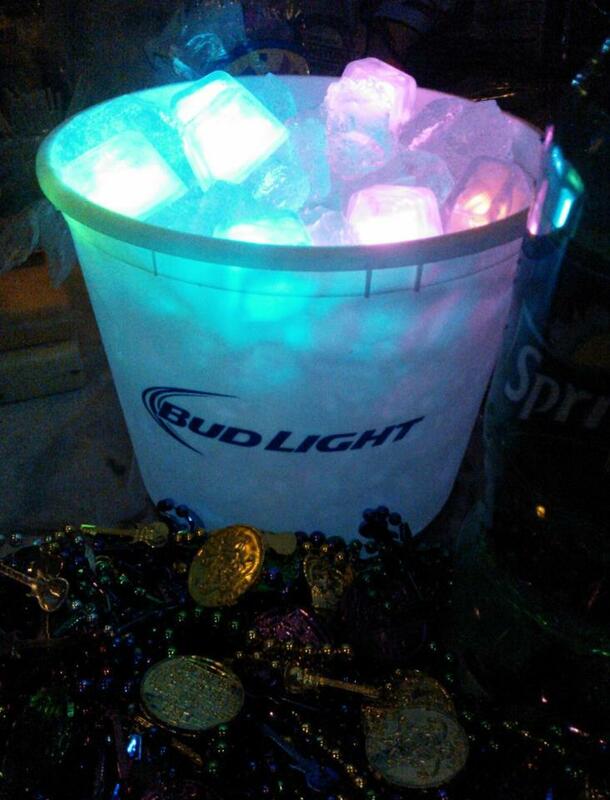 Add ’em to an ice bucket mixed with real ice cubes – this makes party people VERY happy. Now before Inspiration Ice, there was HOLLYWOOD ICE. 1.) Same great price. Just depends on the LOOK you prefer: realistic rectangles vs. sleek squares. 2.) The white cube inside. 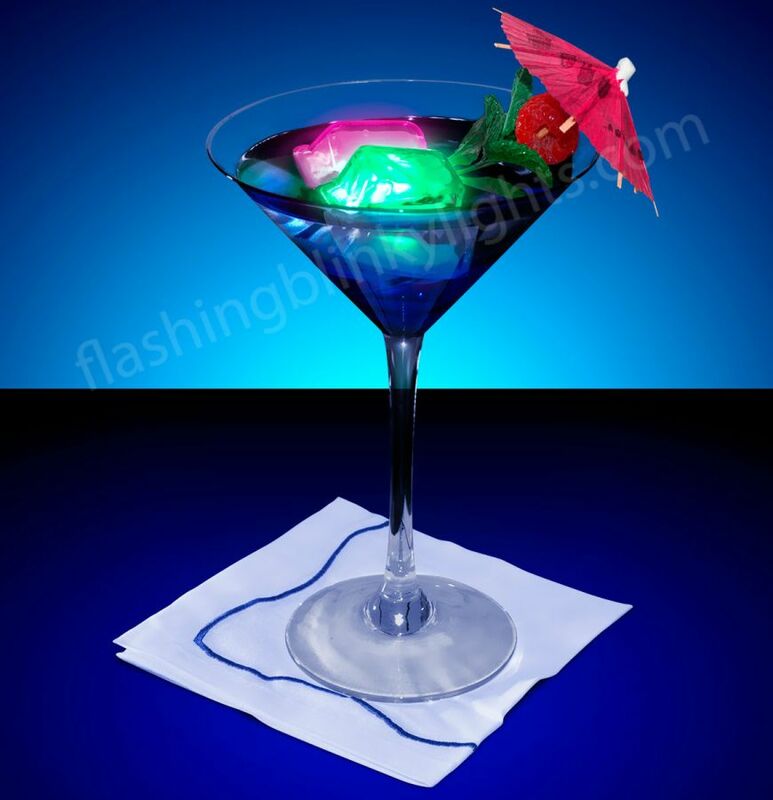 Hollywood Ice cubes appear to glow neon thanks to the inner shell which diffuses the light. 3.) Once again, simple to take with. 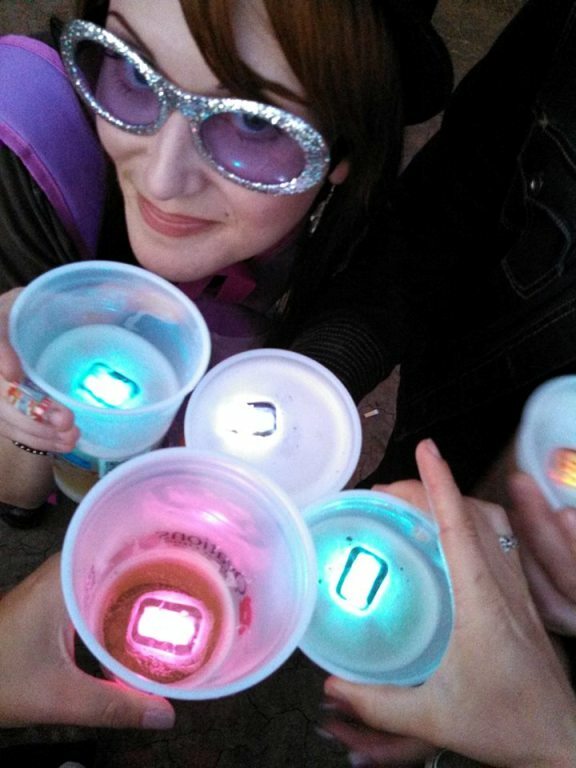 Light glasses are way fun too, but when you’re on the go & taking the party with you, LED cubes are totally the way to go. Check out this delectable spread. 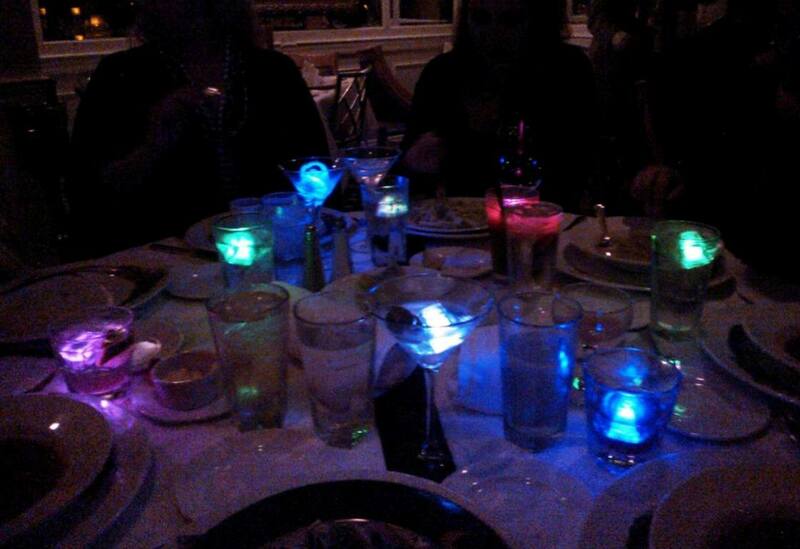 YOU BET I bring ’em to restaurants. 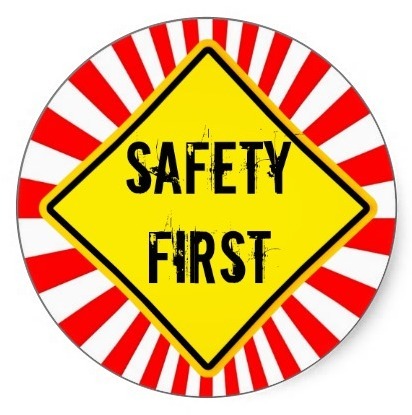 >>> Always tested & boy we are strict. 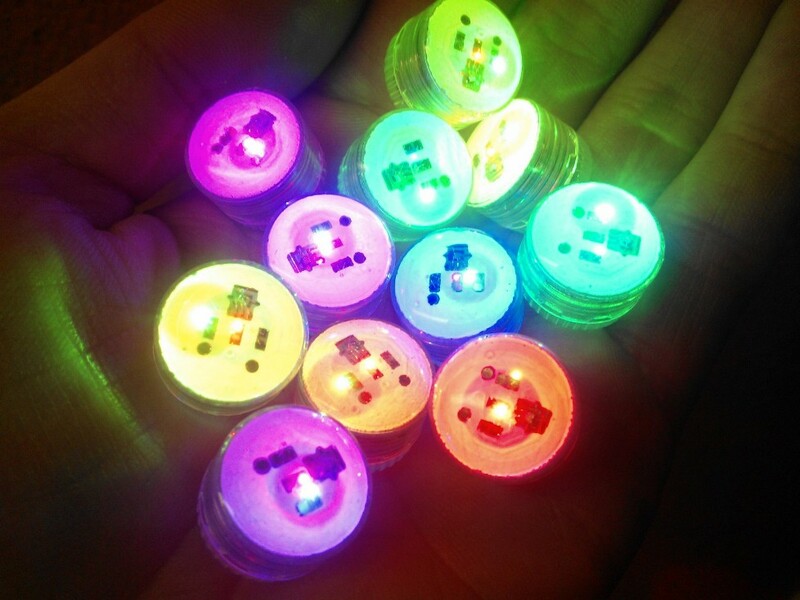 FDA approved plastic, waterproof buttons, and permanently sealed for safety. 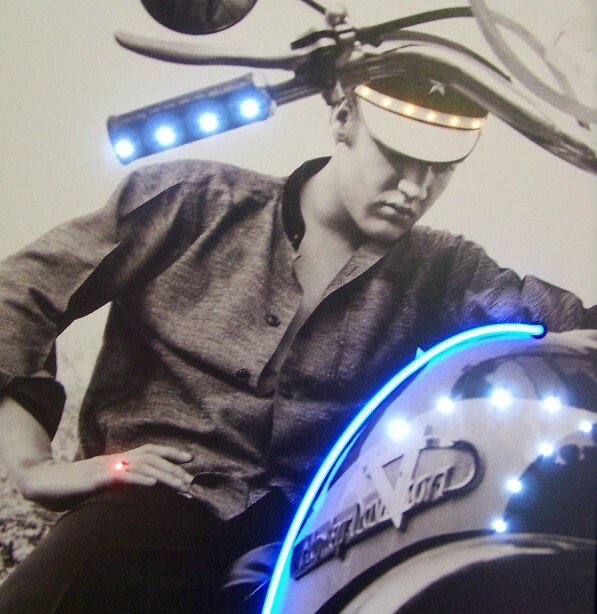 We design all the Light Ups we can to have changeable batteries for multiple nights of fun, but this is one light product you want sealed for good. >>> Color choices! Multicolor allows you to leave it on the steady color of your choice, or a groovy color splash setting which cycles through every shade of the rainbow. 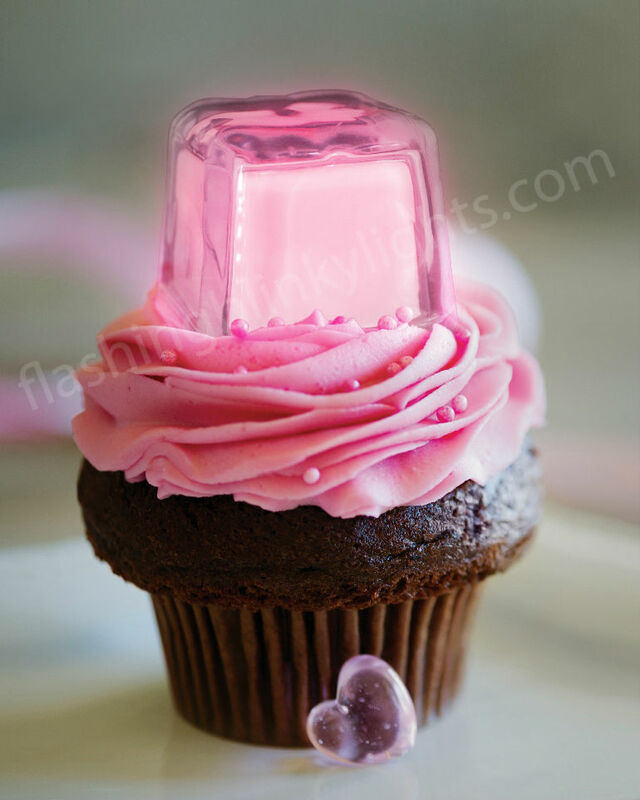 BUT did you know you can buy our LED ice cubes in single colors to match your wedding, event or team colors? 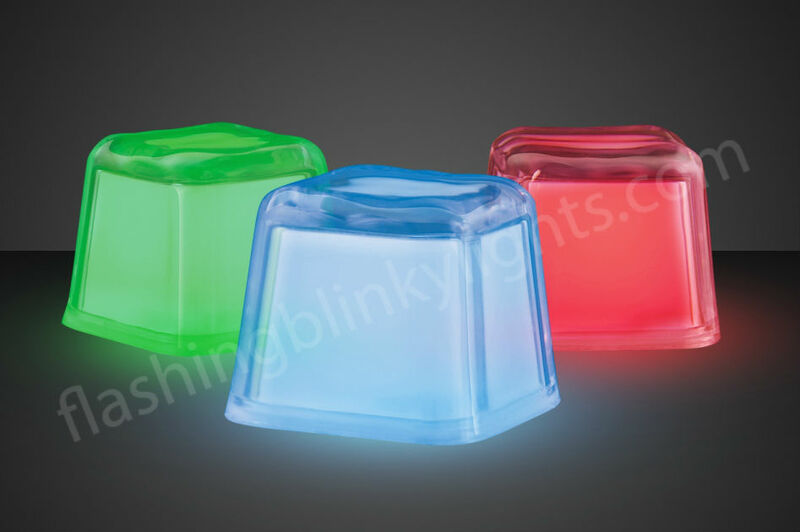 ‘Tis true, and our 1-color cubes give you the option to flash, blink, or stay on steady. >>> Add them to edible creations! 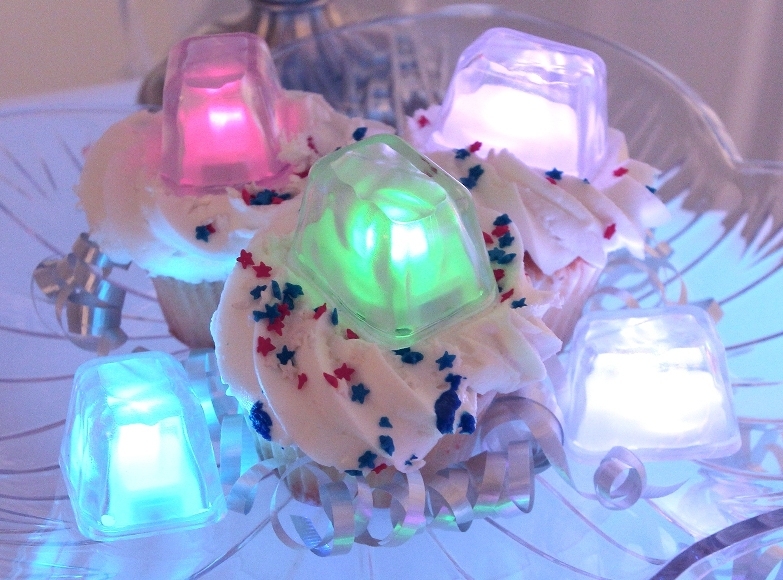 Safe/tested plastic shell means cool to put on cupcakes, illuminate an entire birthday cake or wedding cake, the possibilities are endless if you’re a creative baker! So cute, right? 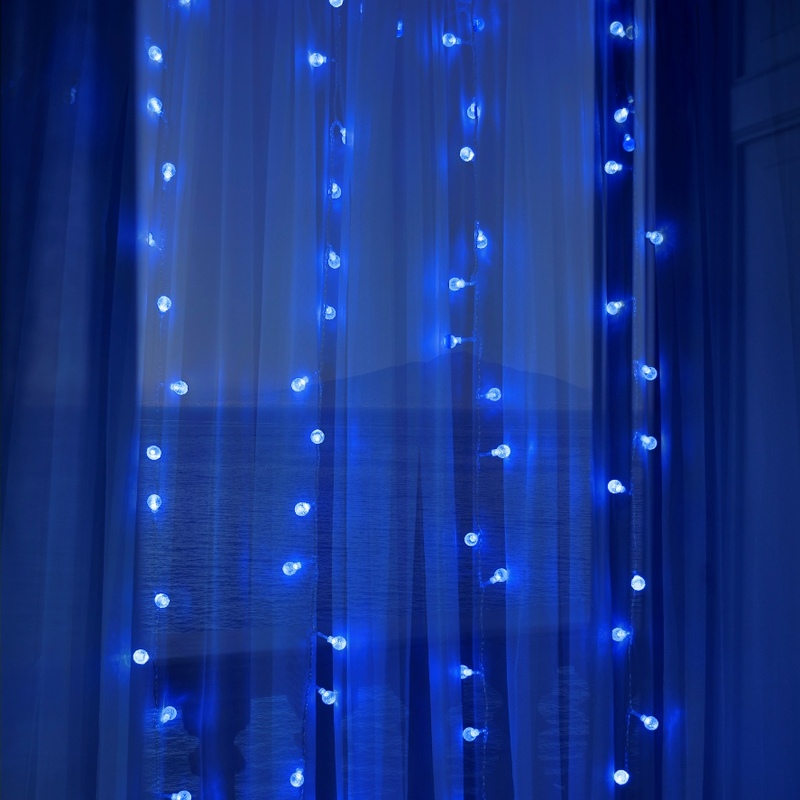 ‘Til next time, light lovers. 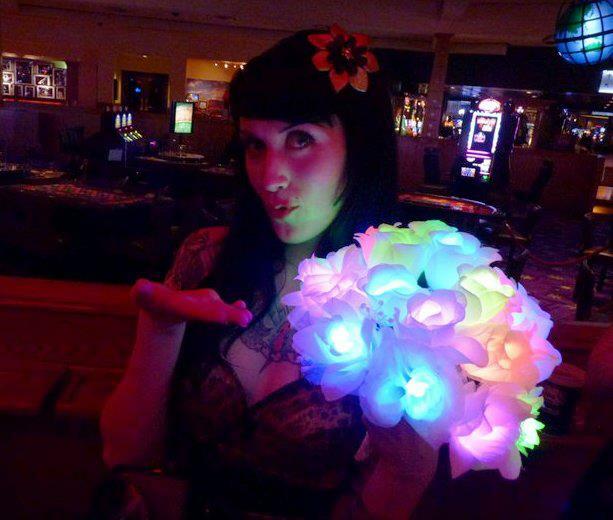 Make A DIY Bouquet Full Of LED Lights! Now where my ladies at?! 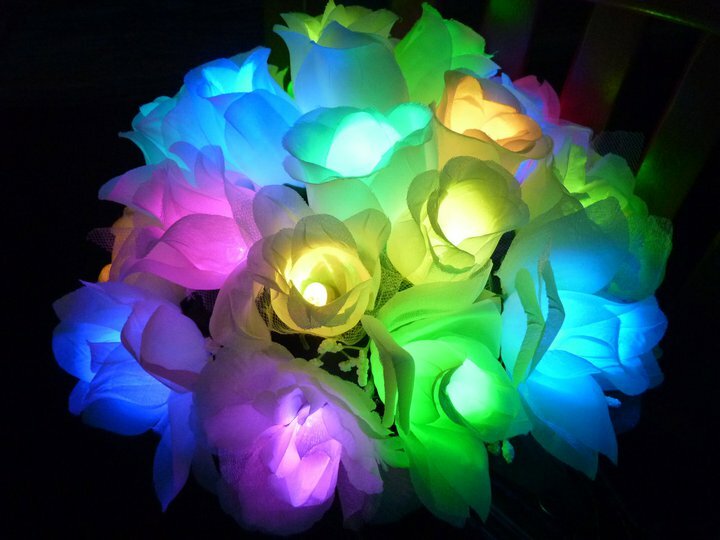 This DIY bouquet light craft is dedicated to all funky brides who think outside the box. 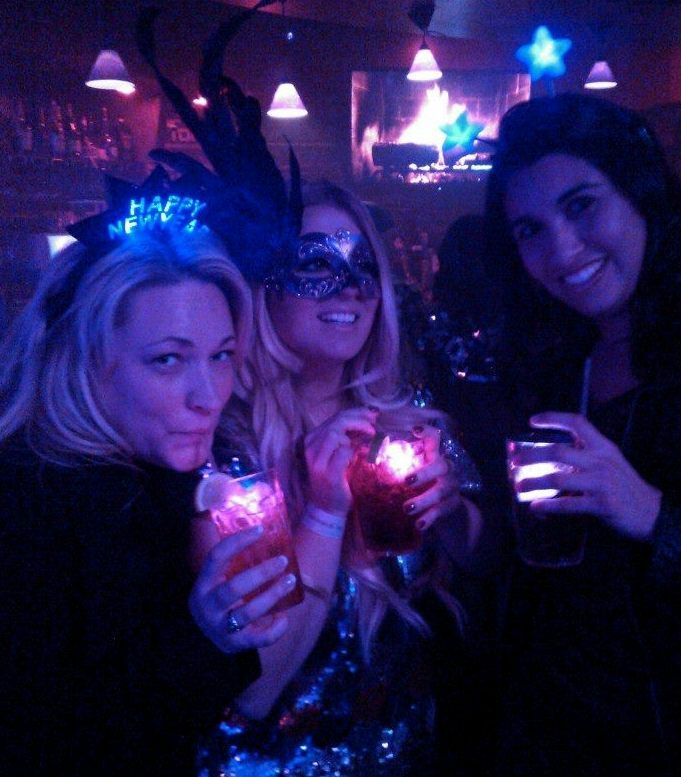 Whether it’s elegant night time nuptials you’re planning, or a wacky tacky Vegas wedding (yes that’s exactly what’s happening to the right, hellooooo match made in Heaven! 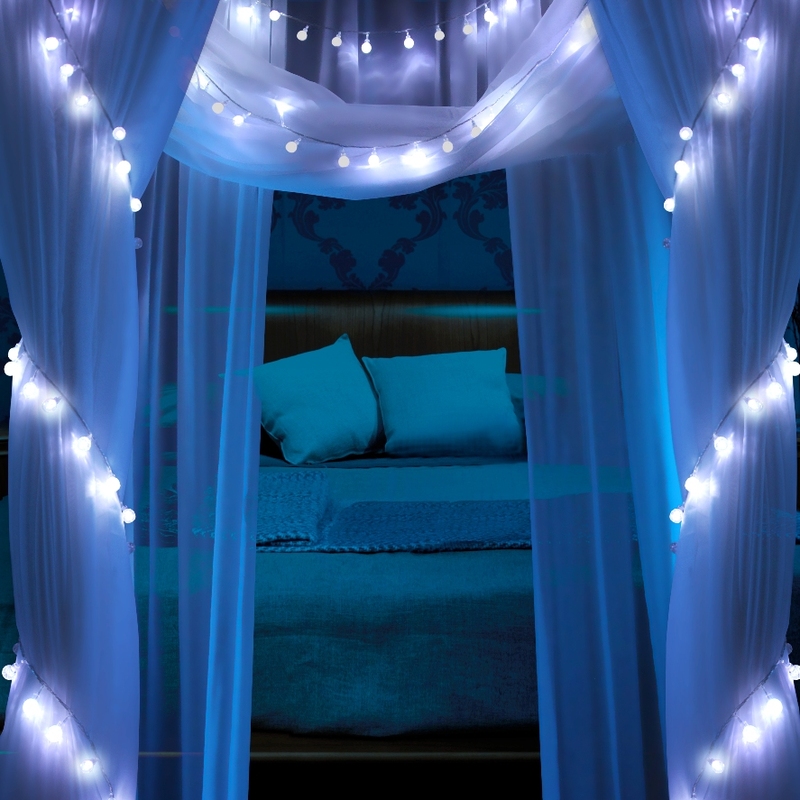 ), a DIY bouquet full of LED lights is going to wOw your wedding guests like nothing else, and boy was it easy on the pocketbook. 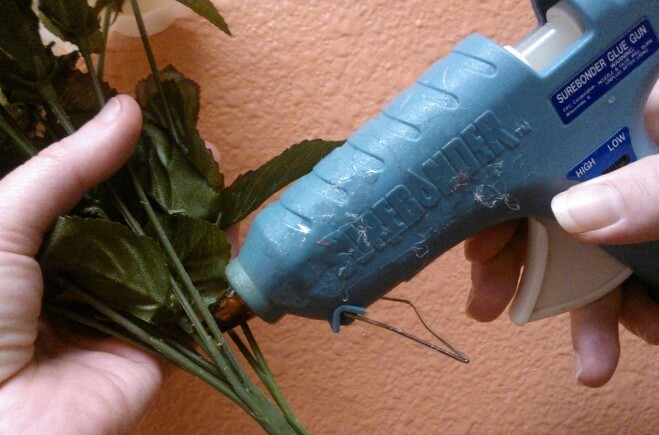 STEP 2 – Loosely hold your flower bunches together, arrange the wire stems to your liking so it all “flows”, then hot glue inside & around the stems. Hot glue your lil’ heart out! You can bind it all together with duct tape too. Nevermind the messy, for you’ll just cover it all up with pretty ribbon. STEP 3 – Cover it all up with pretty ribbon! Put a drop of hot glue where you begin the wrap, let dry then continue all the way down, keeping the wrap tight & smooth. Add a dab of hot glue at the end to secure.